Welcome to The Princess Diaries : adult editionThere's the classification. I wrote it, even though I really want to pretend that I didn't, so I'm able to shelve this as YA.It's the cover! That adorable, sweet, pretty pink cover with the cute (and very young looking) girl winking. I love it - absolutely love it! But does that cover scream royals be gettin' it on!!!? I didn't think so.Nevertheless, I still love this cover even though I can't see a woman in grad school, even when I squint. And I liked this book because it wasn't trying too hard to impress. None of the characters really pushed my buttons and it was a cute little romp overall. 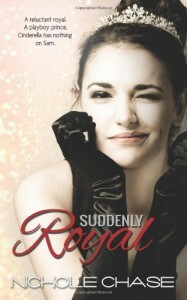 I never read The Princess Diaries and I'm sure the books are quite different from the movies, but a few scenes from Suddenly Royal reminded me of the movies with a little bit of adult sizzle thrown in. I'd say you can't go wrong tossing this in the beach bag or airplane carry-on for an easy escape read which is perfect for summer.Buddy read w/Dija, Sarah, Litchick, etc. over at Dija's pad review. Sorry I sort of slacked on discussing!